Seborrheic keratoses are non-cancerous, wart-like growths that are common in older adults and seniors (hence the nickname the “barnacles of aging”). Although these are harmless skin growths, they can resemble precancerous growths called actinic keratoses. Dermatologists thus recommend getting all keratosis growths examined, as a precaution — it’s better to have a false alarm than unknowingly have a skin cancer growth. While a seborrheic keratosis is normally asymptomatic, sometimes these growths produce uncomfortable symptoms, as well as cosmetic concerns. At Advanced Dermatology & Skin Cancer Center, we offer the most modern seborrheic keratosis treatments. Contact us to learn more. Seborrheic keratosis can develop anywhere on the body (except for the palms and soles). They are especially prominent on the head, neck, back, and chest, and can appear in bunches or as individual growths. Visually, seborrheic keratosis resemble warts with a waxy texture. They range in color from white to black, but most are tan or brown, or just a few shades darker than the person’s skin tone. Individuals are most likely to notice growths first appearing in their middle ages or later. Seborrheic keratosis starts out as small bumps with a rough texture and gradually thicken to as large as half dollars. Although the symptoms are usually mild to nonexistent, seborrheic keratosis symptoms can sometimes cause discomfort. The growths are not generally associated with pain, however, they can cause itchiness or even bleed profusely after rubbing against surfaces. If you experience these symptoms, let our dermatologists in Boardman, OH, treat them with an alpha-hydroxy lotion or a topical steroid. What causes seborrheic keratosis remains a mystery. However, physicians have found discernible trends regarding these skin growths. Seborrheic keratosis tends to affect middle-aged and elderly people. After 50 years of age, people can expect seborrheic keratoses to appear at some point. These skin growths are rarely found on children. A genetic predisposition to seborrheic keratosis can run in a family’s history and be inherited by generations of family members. Skin tone can somewhat determine the frequency and size of skin growths: people with lighter complexions are more prone to larger sizes and quantities of seborrheic keratoses than those with darker skin tones. There seems to be a correlation between higher rates of long-term sun exposure and increased incidence rates of seborrheic keratosis. A dermatologist can diagnose a seborrheic keratosis through examination. A few seborrheic keratoses that develop gradually over time is normal and usually not a cause for concern, especially for people older than 50. However, if several skin growths appear in a short amount of time, or existing skin growths change color, that could signal a skin condition other than seborrheic keratosis, and an examination is necessary. 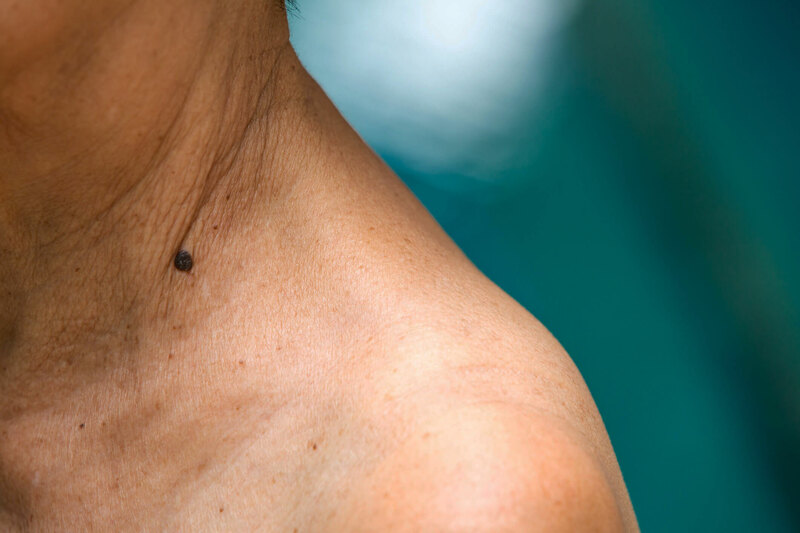 A dermatologist can determine whether wart-like growths are seborrheic keratosis (benign) or actinic keratosis (precancerous) based on their appearance. But in cases where the growth resembles skin cancer, the dermatologist may perform an additional biopsy to form a definitive diagnosis. Seborrheic keratosis removal may be required when skin growths itch or bleed as a result of them rubbing against clothing. Dermatologists may also remove a seborrheic keratosis for cosmetic reasons. Growths on the face or neck may be unsightly and affect a person’s self-confidence. Our skincare specialist can utilize cryosurgery or electrocautery to surgically remove a seborrheic keratosis to reveal the person’s beautiful, blemish-free skin. To explore your options for skincare, schedule a consultation.